Google Translate APK 5.2.0.RC09.128106141 offers an easy way for us as the automatic translation machine. Translating the simple words until the complex texts or phrases can be done easily using this application. It allows us doing the translation job from one language to another from over sixty options of language available. It also provides more handwriting languages. This application gives the most accurate translation and provides the result that makes us confidence in. In addition, Google Translate is also simple to use. We just have to write all texts we are going to translate in its column. Then, choose the original and detect language to be translated to. 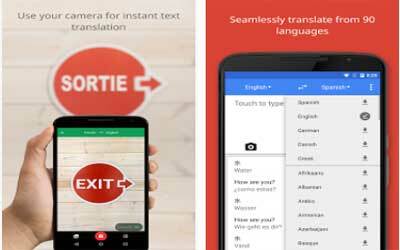 This app will automatically translate the texts to the language chosen. As information, Google Translate can also be used to translate texts from drawings and photos as well as to translate the audio. It serves good recognition for voice. It is not only can be used online, but also offline by downloading the desired languages. Thus, the internet connection will not be needed any longer to do the translation job. This makes it easier for those who need Google Translate regularly to support study and work purpose or just for pleasure. If you are going to translate texts from short message service in Android, you can also do it using this app. Just choose the option and select one received message from the list shown. Then, the app will translate it immediately. Another service provided is that you can listen to the pronunciation of translation and the entries you have made. This service with its simple design is even easy to be used by the inexperienced one. Furthermore, it provides translation history that allows users to save the translation. It can be said that Google Translate for Android is excellent application for excellent translation. Download language packs for when you’re traveling, or if your connection is expensive or slow. Includes transliterations in Tap-to-Translate. Minor bug fixes. Android Nougat Support.